This salad works well beside roasted meat and fish, omelets, quiches, or just on its own. If you don’t need the whole bunch of watercress — for example, if you’re cooking for one — how much to use? Count on one generous handful of watercress leaves per person. Then adjust the dressing accordingly. As for which oil to use, it’s a matter of taste. Watercress salad is generally served in France with a salad oil more neutral than olive oil — sunflower oil, for example, works well. It’s lighter than olive oil and complements the sharp taste of the watercress and the lemon. But a little olive oil combined with another oil can also be delightful. Trim the larger stems from the watercress. Wash well and spin dry. In the bottom of a large salad bowl, combine the lemon, oil and salt. 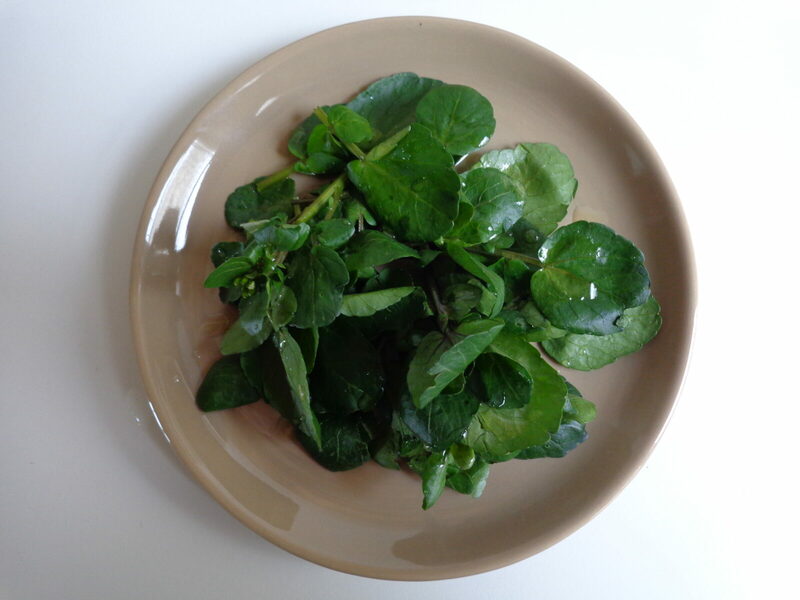 The watercress itself is so peppery that you will not need black pepper. Place the watercress on top of the sauce. Mix the salad only at the last minute. Serves 3-4.